If you’re looking to combine proximity to water and a mountain view, look no further than Captain’s Quarters on Lake Lure. This 3-bedroom, 2.5-bath home features stunning water views with distant mountains. And as a bonus, it comes with kayaks, so you can explore the water, even when colder weather arrives. The light-filled interior provides a quiet, peaceful respite for guests. Each bedroom has a gorgeous view, and guests can unwind in front of the gas log fireplace. In addition to the indoor sitting areas, there are multiple opportunities to enjoy the lake as well. Whether you’re around the firepit, on the outside deck, or in the spacious sunroom, you’ll have incredible views of Lake Lure. Because of its location, on the end of a point of land, the rental home has unobstructed water views from several perspectives. And with the provided kayaks and its dock, guests can explore Lake Lure from a couple of vantage points as well. The town of Lake Lure has a beach area, a water park for children, and multiple dining spots. It’s also only 20 minutes from Chimney Rock State Park, 40 minutes to Black Mountain, and under an hour to all the happenings of Asheville. 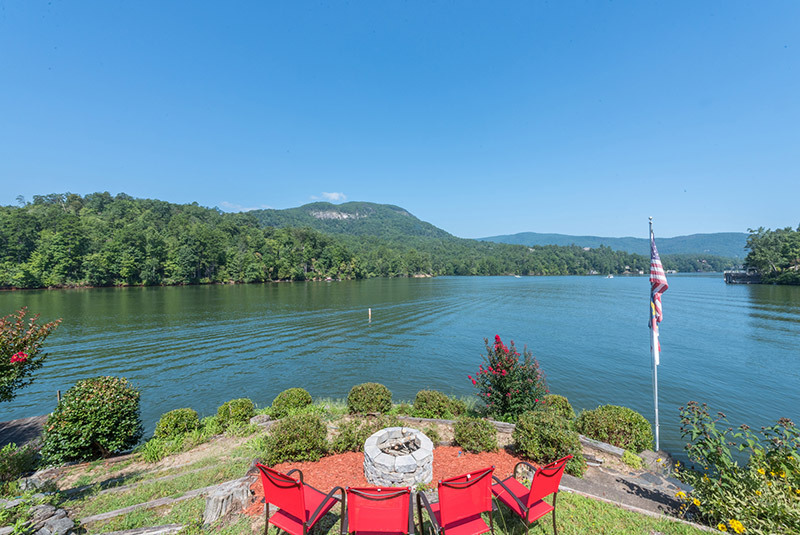 If you’re attracted to Lake Lure and want to experience it from a waterfront property, this Greybeard Rental home makes a great escape to lakefront living. For other new rental homes, please take a look at Greybeard’s newly listed rentals page. And if you want assistance in finding your perfect Asheville area rental home, please contact Greybeard Rentals directly. Whether its lakefront, mountain top, or secluded hideaway, Greybeard Rentals can help you find the right western NC rental home.